We've been to Naples. Love the place. The chaos is part of the charm and they know a thing or two about pizza. However we've always taken more of a lead from what's going on the other side of the Atlantic. We're not Italian and don't pretend to be, so freed by the constraints of 'they don't do that in Naples' we take inspiration from the style and techniques, but use these to showcase the produce and flavours on our own doorstep - just like our favourite places in the US have done for years. This trip was about inspiration, a motivational boost before we commit to the restaurant and kiss our holidays goodbye. 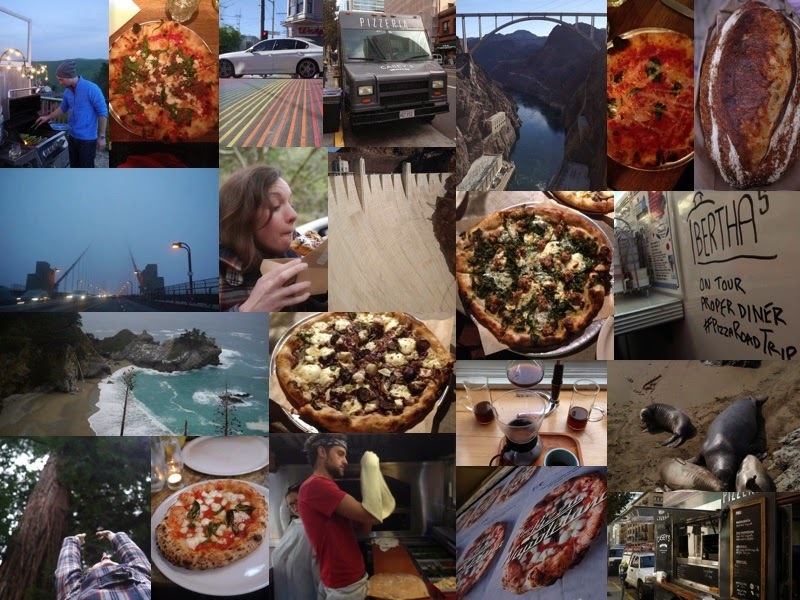 It wasn't about emulating any particular pizza or style, more about learning how those at the top their game manage their lives around a successful business. So to Portland home of Lovely's Fifty Fifty, to visit Sarah Minnick and some of the prettiest pies around - works of art. Sarah visits the market every week and her pizzas are a barometer of seasons, she also makes the best ice cream in town. Portland’s often compared to Bristol, it’s the cycling capital of the US and home to a thriving coffee and craft beer scene. It also rains. A lot. Luckily Sarah had offered to drive us around town and take us to some of her favourite spots. First up Roman Candle, Roman style pizza al taglio, or by the cut, with big communal tables, inventive salads and the most extravagant handmade Italian oven just to reheat slices. Next, Powell’s bookstore which we’d add to any visitors guide, the cookbook section alone being larger than most UK bookstores. After some due diligence on the local coffee and craft beer we circled back to Lovely’s and opted for their nettle special and a melted leek option. Both excellent but the leek pizza with a hit of chilli infused honey stands out as one of the highlights from the whole trip. Midway through the meal it became apparent that a ‘pizza each’ order was rare, most couples opting to share and still take a few slices home. We weren’t to be beaten by a 12” pizza but it wasn’t until chatting to Sarah later when she let slip her dough balls are scaled 60% heavier than ours that we appreciated how much we’d eaten. We weren’t prepared to skip on dessert though, and their walnut butter ice cream made it clear their reputation on desserts was well deserved. This was all washed down with some house made kombucha a curious self carbonated drink I’d been sceptical of on previous US visits but Lovely’s version was crisp, refreshing and had me sold. Phoenix is enormous. Sprawling and hot. Sixty miles across everyone drives but we beamed like kids cycling around on cruisers with the sidewalks to ourselves. Arriving in Phoenix our hosts informed us that most visitors are there to tick off three things, the Grand Canyon, Sedona and a meal at one of Chris Bianco’s restaurants. Our top three was different - a meal in each of Chris’s three restaurants in town. Chris is a legend in the industry and also one of the nicest guys you’ll ever meet. His energy and enthusiasm is off the scale and he knows more about the UK than most natives. We started at Pane, appropriately named as that’s where all their bread’s made, a large, functional but attractive hub for operations. There we met Marco, Chris’s brother, head baker and grains enthusiast and enjoyed the first of our Bianco meals, wood baked focaccia sandwiches, my favourite of which packed with their house made mortadella. From Pane to Downtown the original(*), his first oven setup in the courtyard, a working monument to where it all started. Chris hand mixed dough here for over a decade which puts my own gripes about hand mixing into perspective. He made us two pizzas, two classics, a marinara and a rosa. Watching him work dough is hypnotic. He remains focussed on the conversation but with the deftest of touch two pizzas appear in front of you. At this point his diction accelerated as he rattled off advice he wished he’d been given early in his career, lessons you only learn with 20+ years in the business. Then before our stomachs registered they’d reached capacity we were off to Town and Country (*) the actual site of his first restaurant which they left after several years and returned decades later. Town and Country is housed in one of Phoenix’s many strip malls, an oasis of Bianco charm amongst the nationals. Chris greets everyone. Seems to know everyone and there’s a story behind each piece of furniture and purpose behind each motion on site. 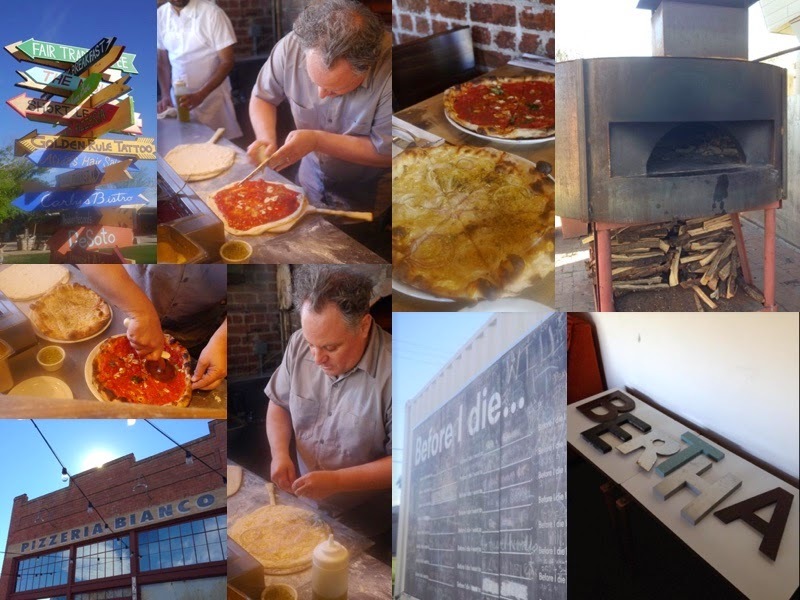 Town and Country serves pizza but we were there for the pasta, all handmade with the trademark focus on ingredients. We were about to pop. Feeling sleepy and content we headed back to our accommodation for a nap. At this point it’s worth a thank you to our AirBnB hosts in town, Shawn and Chad who not only loaned said bikes but took us out for drinks, drove us around town and also gave us a set of “Bertha’s” salvaged letters - a reminder of our west coast tour which will hopefully grace the walls in our restaurant. Our ‘Compact’ hire car booking was vetoed by the staff at the rental booth on the grounds of safety and in the first case of up-selling I’ve not grown to regret we were handed the keys a 400bhp beauty - Deloris as she became know. I’d been privileged to visit Flagstaff before where I’d staged at Pizzicletta and wrote about here but it was great to be taking Kate to the place I kept banging on about. 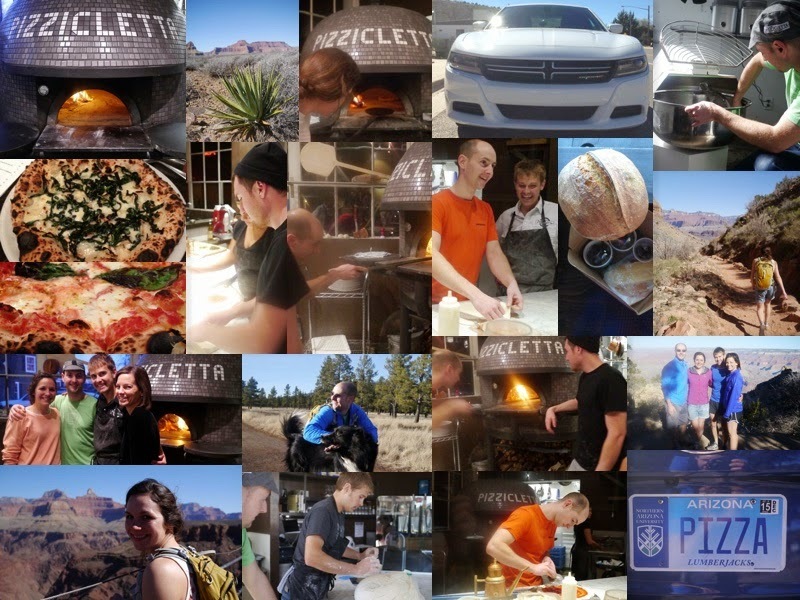 Flagstaff is a stunning mountain town, a haven for outdoor enthusiasts and if it didn’t already house one of the best Neapolitan pizzerias in the world we’d consider setting up shop. Somehow the pizzas have got better since my last visit. Credit to Caleb’s drive and commitment to improvement. The mozzarella now made in house has a more uniform, creamy melt and the dough, fully sourdough these days on a regimented feeding regime with a new mixer, is lighter with more loft. Did I mention we ‘happened’ to be in town for Arizona beer week? Determined not to end up too massive we took some time to get on the trails. The route down into the Grand Canyon being one of my all time favourite walks hikes. It really doesn’t get much better than spending the day outdoors with good friends before heading back and enjoying a good meal. Yes pizza. With a slight waddle and inability to squat we did our best to lend a hand around the pizzeria. We balled dough, baked bread and chatted about our respective plans, ways to grow and improve. It was a privilege to be back. Sad to leave we pried ourselves away, heading for the coast, scenic roads and the sourdough mecca that is San Francisco. Everyone we’d spoken to loves the place. It’s easy to see why and having ticked off the tourist spots quickly we settled into a routine of alternating artisan coffee spots and temples to gluten. 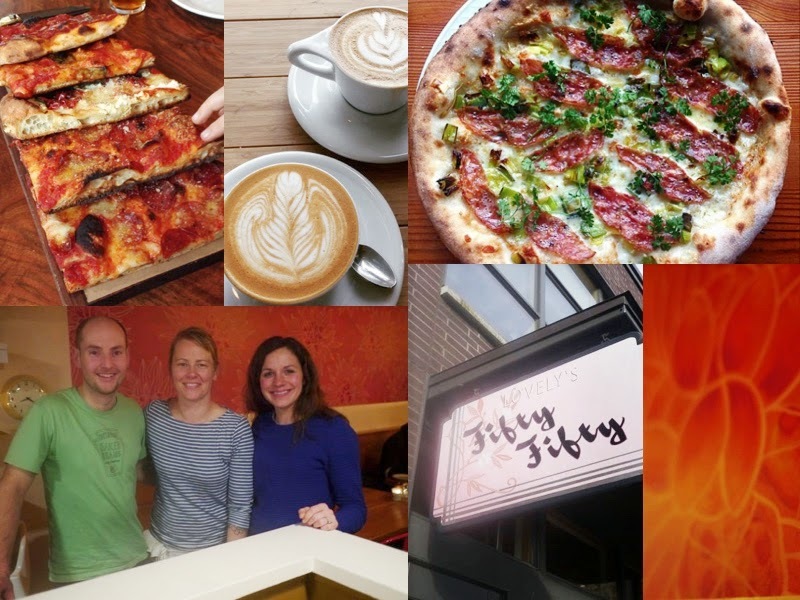 Delfina, Casey’s, Tartine, Una Pizza Napoletana, Jane on Larkin, Pizza Hacker - I could write a blog on each of these from the notes I scribbled on each visit - perhaps I will if anyone’s interested? But this was more about setting us up for the next step, for inspiration and focus to get us through the tedium and red tape that comes with launching a restaurant. The best part of the trip wasn’t the food though, nor the views, the coffee, wine or beers. It was the people. Time and time again we were floored by their generosity, the insights shared, lessons learned and passed on. We’re eternally grateful and can only hope we can build on that advice and pay it forward - humble pie.